Scriptr.io is revolutionary platform that allows users to “create and deliver IoT (internet of things) applications.” The company has seen unprecedented success in fundraising, in both Lebanon and New York. Middle East Venture Partners led the $5 million investment deal with Scriptr.io. The company has the potential to continue rapid and aggressive growth, but it is still to be determined if this can be maintained in Lebanon, or if the company will be encouraged to seek international growth and support. While Scriptr.io landed a large investment by Lebanese standards, it still will need substantially more to scale up and capitalize on the IoT opportunity.Does Lebanon have the ability to create a Unicorn? A Unicorn is a start-up valued at a billion dollars or more, and is an indicator of key success to foster multi-generational entrepreneurs. Lebanon is at an important juncture. The country has the potential to create a startup ecosystem and is facing the risk of falling behind other countries in the region. Lebanon needs to pay attention to their capabilities and brand if they want to create a unicorn. If they do not focus their efforts, there will be no serious value creation and current funding will fizzle out and the country’s startups will lose all momentum. Lebanon would benefit from manifesting as strong startup environment, but could be deterred from this goal. Lebanon would greatly benefit from manifesting Unicorns as a basis to a growing economy and rapid technological growth. High-growth firms lead to greater overall job growth and higher paying jobs. High growth firms make up 50% of the new jobs in theUS. Companies that are creating new products are 95% more likely to increase hiring efforts, overall Strong entrepreneurship also leads to a great ratio of exports to imports and improves the country’s account balance. The majority of manufacturing from US startups occurs domestically, which drives international demand for US-made products. 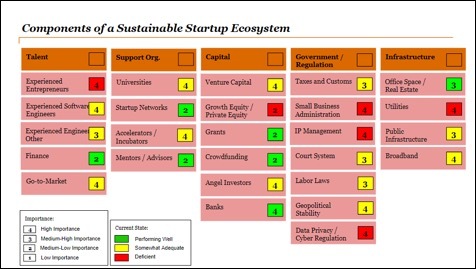 There are evident and ample benefits to structuring an economy around nurturing startups. The country must focus on the areas where they are currently deficient, which also have the highest impact on creating a strong startup environment. Also, they will not find success unless they are attentive to their brand and perceived attractiveness for startups.It is important to note the difference between the capabilities and the brand.The capabilities are a factual perspective of where Lebanon stands today, versus the brand is the perception of Lebanon.While Lebanon’s capabilities have room to improve, the perception lags far behind the actual progress achieved to date.International brand is impacted by elements of government regulations and geopolitical matters. Government regulation includes small business administration, balanced IP laws, and a beneficial tax environment for entrepreneurs. Local and regional geo-political stability affects attractiveness to foreign investment, local immigration and the desire for individuals to remain in the country. Lebanon’s brand would improve by addressing diplomatic awareness, advertising, and compliance standards that support business growth. The country overall is ranked quite low on ease of doing business and starting a business. Lebanon has the potential to improve on their international brand presence and develop the foundation for a Unicorn-capable environment. Lebanon has experienced some momentum recently in the realm of entrepreneurship. There are increasing number of private funding firms and incubators, and Circular 331 was a critical contributor to facilitate initial funding. The country has experienced a 24% compounded growth rate in startups since 2009. The government is supportive of start-ups and there is hope that policy will move in a positive direction for budding founders. There is a strong engineering talent pool, a free market economy, and entrepreneurial culture in Lebanon, which are basic tenets of creating a startup environment. Despite recent momentum, many critics doubt whether or not Lebanon can maintain this growth rate. There has not yet been any large sized exits of Lebanese startups to date. Currently, capital is really only available from one main source - Circular 331 - which will limit the growth potential of any companies. Lebanon is struggling alongside other MENA nations to improve its brand and reverse current practices of bureaucracy and other elements that make the “environment more hostile to start-ups than other parts of the world.” Current migration patterns are also working against Lebanon’s ability to retain talent, a concept often referred to as the “brain drain.” These elements are all threatening to any momentum Lebanon has created up to this point. At a time in Lebanon’s history when there is great talent, budding capital, and a supportive government, the country has the potential to create what is needed for a strong startup environment. In order to continue on an upward trend, however, the country must be attentive to its reputation and brand internationally, aspire to retain more talent, and build a larger system to support entrepreneurship. There is currently limited small business support and unreliable data security. The government will be forced to implement more rapid regulatory change in order to build the foundation to support the creation of Unicorns. The government and the entrepreneurial community should align on the both the regulatory priorities, and how to enhance the brand of Lebanon to avoid any stigma of investments.Such dialogue is a good start to build a common understanding, and re-frame of the view of Lebanon from the West by demonstrating its commitment beyond initial capital.